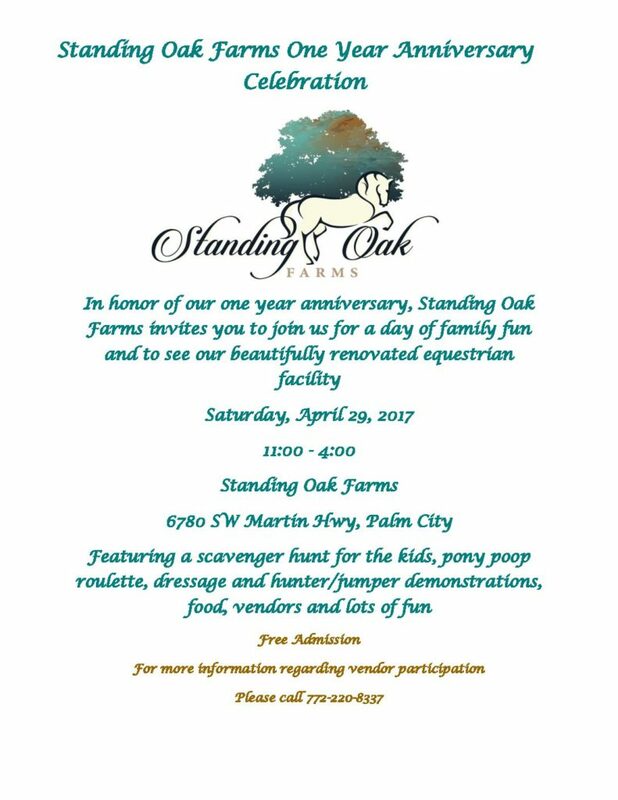 Standing Oak Farms would like to invite you to join us for an afternoon filled with food, fun and entertainment on Saturday, April 29, 2017 from 11:00 – 4:00 as we celebrate our one year anniversary. It’s hard to believe that it was less than a year ago that we purchased and began massive renovations on what was formally known as the Martin Down’s Equestrian Center. Now that the dust has settled, we are excited to finally be able to share our beautiful new facility with you and the equestrian community. There will be fun and games including an Easter egg hunt for the kids, dressage and hunter/jumper demonstrations, food and live music. To show our appreciation for your warm support, we would like to invite you to set up a booth to promote your business at our event free of charge. You are free to market your business as well as sell merchandise where applicable. The only requirement is that you supply a 10 x 10 tent, 8’ table and chairs.